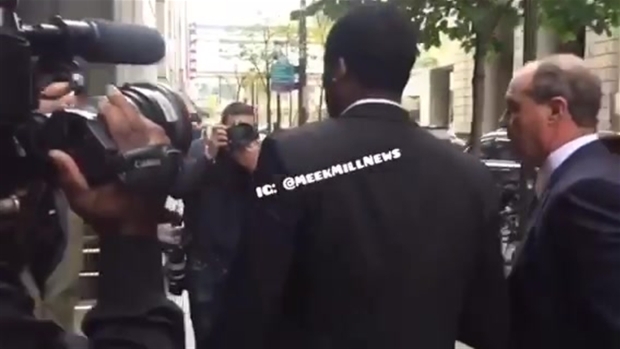 Mill tells Holt when he's released, he sees himself "helping minorities that come from these situations like myself"
Rapper Meek Mill says he always thought 10 years of probation would bring him back to prison. Mill spoke to news anchor Lester Holt from a Pennsylvania prison in a phone interview that aired Thursday on "NBC Nightly News." The Philadelphia-born rapper, whose real name is Robert Rihmeek Williams, is fighting for release while appealing a two- to four-year sentence for a probation violation. A judge said his drug use, arrests and other issues while under supervision merited the jail time. Mill's lawyers accuse her of a "personal vendetta." Mill told Holt that when he's released, he sees himself "helping minorities that come from these situations like myself." New England Patriots owner Robert Kraft and Philadelphia 76ers co-owner Michael Rubin visited Mill in prison Tuesday. Afterward, Kraft called for reform of the criminal justice system. Philadelphia's mayor visited Wednesday.